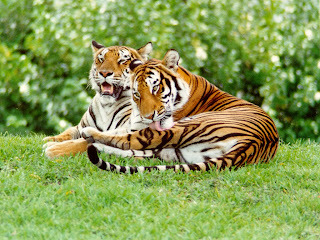 Animal Wildlife | Malayan Tiger | The Malayan tiger is a smaller-sized subspecies of tiger, found throughout Malaysia and parts of Thailand.The Malayan tiger is today an endangered species but one of the more numerous wild tiger species.The Malayan tiger is found throughout the southern and central parts of the Malay Peninsula with its range also extending into parts of southern Thailand.The Malayan tiger is found inhabiting the less-dense forests and jungles where there is a higher supply of food. The Malayan tiger is the smallest species of tiger along with the Sumatran tiger, with average female Malayan tigers growing to around 2 meters in length. The smaller size of the Malayan tiger helps it to remain unseen in the clearer parts of the Malaysian jungle. The Malayan tiger was once thought to be the same as the Indochinese tiger, a larger tiger species found in the more northern parts of south-east Asia, and it was only recently that the two were classified as separate subspecies. The Malayan tiger is a dominant and carnivorous predator, hunting it's prey by stalking it until the Malayan tiger has the opportunity to catch it off guard. 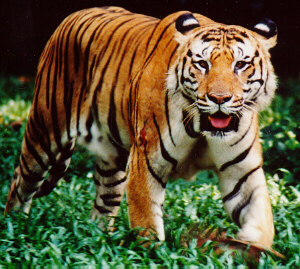 Malayan tigers primarily hunt larger mammals including deer, wild boar, cattle and goats. 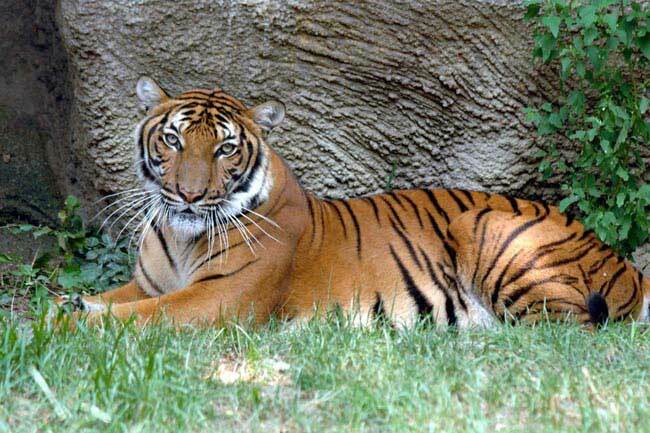 Due to the size and power of the Malayan tiger, it has no natural predators in its native environment. 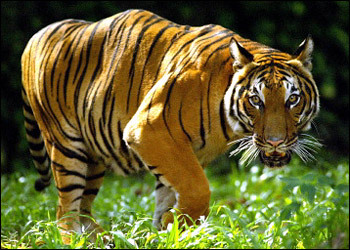 Humans that hunt the Malayan tiger and habitat loss are the only threats to the Malayan tiger. 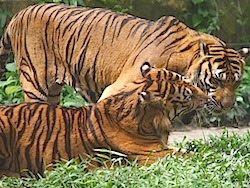 After a gestation period of 3 to 4 months, the female Malayan tiger gives birth to up to 5 cubs. Newborn Malayan tiger cubs weigh about 1 kg (2 lb) and are blind and helpless. The mother feeds them milk for about 2 months and then the Malayan tiger cubs are introduced to meat. Malayan tiger cubs depend on their mother for the first 18 months and then they start hunting on their own. Today, due to habitat loss caused by deforestation, and hunting by human poachers, the Malayan tiger is considered to be an endangered species. Modern estimates suggest that the current wild Malayan tiger population is between 600 and 800 individuals, making it one of the more numerous tiger species. 0 Response to "Malayan Tiger"